Apparently this heat has the Oregon Zoo's newest elephant Samson looking for a frozen treat. Ruby Jewel, a local handmade ice creamery known for luscious ice cream sandwiches, has worked up a special treat in his honor. The Samsonwich features strawberry, banana and apple ice cream sandwiched between two lemon cookies and covered with rainbow sprinkles. 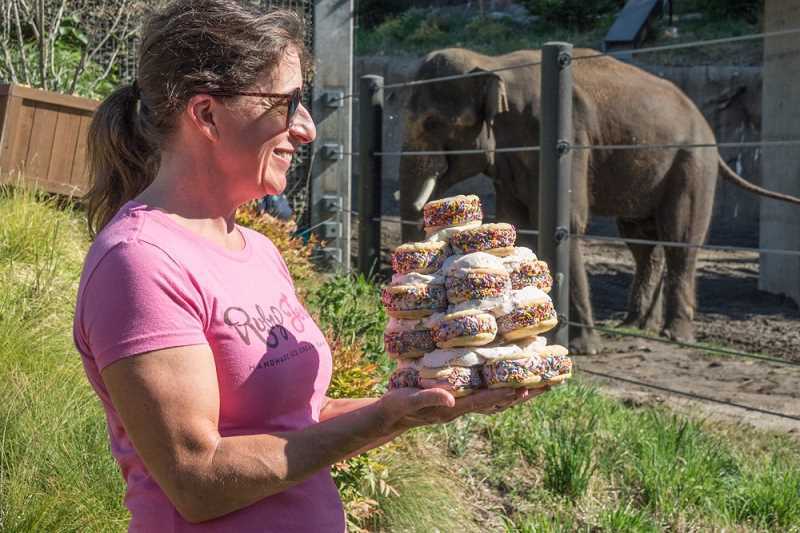 It's now available at the Ruby Jewel cart at the zoo, according to a press release, and a dollar from every sandwich sold goes to the Oregon Zoo Foundation, which supports the zoo's wildlife conservation efforts and has established a $1 million fund benefitting Asian elephants. On Monday, July 23, Lisa Herlinger of Ruby Jewel presented Samson with a pyramid of the treats. "Samson ate his ice cream sandwich in about three bites," said Bob Lee, who oversees the zoo's elephants. "Of course, Ruby Jewel asked us about his favorite fruits so they could include them in the recipe." The sprinkles used in the recipe are made with all-natural ingredients, the release says, including sustainable, deforestation-free palm oil in keeping with the mission of elephant conservation. The Samsonwich will be available all summer long from the Ruby Jewel cart at Elephant Plaza, within view of the elephant who inspired its creation.